A quiet little ramble in the remote valley of Grisedale visting a number of long abandoned farms before enjoying more extensive views on the return. 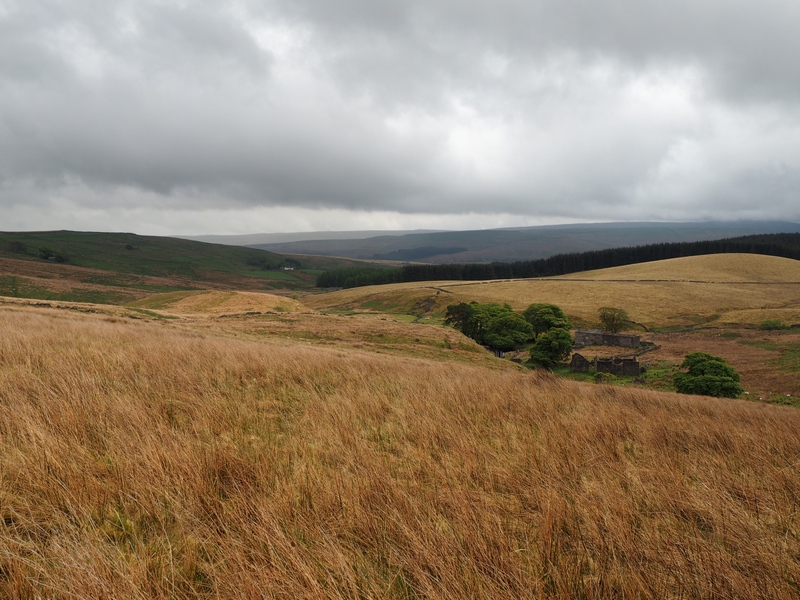 This was the second of two walks that I did in one day in the north-west Yorkshire Dales. In the morning I enjoyed a lovely walk in the Mallerstang valley visiting Hellgill Force. Afterwards I drove over the watershed into upper Wensleydale before crossing yet another watershed to reach Garsdale Head. Parking my car on the small road just below Garsdale Head station I then set off to explore Grisedale. Grisedale is a remote little valley that gained a measure of fame in the 1970’s thanks to the documentary ‘Grisedale – the Dale that died’. At the time only one family was left in the valley. I’d not visited Grisedale since 2005 when, on a particularly wet and murky day, I set off with two friends to climb Baugh Fell. After such a long time I was keen to revisit the place and explore it in a bit more detail rather than merely ‘passing through’. Opposite the road junction at Garsdale Head a thin and churned up path climbed up and across a pasture to a gate. In the next pasture I’d hoped to detour from the path to go in search of Clough Force. Unfortunately for me the area above Grisedale Beck was full of grazing cattle. While most were highland cattle, which don’t generally bother me, there were plenty of calves which is always a bit risky. Swallowing my disappointment at not being able to visit Clough Force (which to be fair seems a fairly small and innocuous looking waterfall anyway) I gave the cattle a wide berth to reach a stile. At this point it began to rain steadily. On I continued across a very dreary section of moor with the desolate slopes of Baugh Fell above me to the left. Eventually I reached the house at Mire Garth. It continued to rain for the next mile and a half as I forged my way up the valley passing numerous farms. Some, such as the houses at Beck House, Moor Rigg and Reachey have been restored and are once again inhabited. Others such as Rowantree, East Scale and West Scale are in various states of decay. Although I was initially disappointed with the rain it did in fact suit the rather sombre mood of the place and gradually I began to enjoy myself more. Indeed the highlight of the walk was the faint beckside path above Reachey along Grisedale Beck. This eventually led to a super packhorse bridge that once gave access to the farms at East Scale and West Scale. Beyond the bridge the path climbed up through a reedy section to arrive at the ruins of Round Ing. Here a few breaks of sunshine pierced the cloud cover and I was able to enjoy wider views across the valley. At this point I doubled back on the faint path heading for Flust. From Flust I took a track heading along Grisedale Brow. On newer maps this part of the walk is marked as following Wainwright’s Pennine Journey. In addition to views back over Grisedale one notable feature of this section was the kiln that had been converted into a tiny shelter, presumably for animals. The track soon merged with the bridleway from East House. Following this over a brow I began a descent into Wensleydale with superb views of the valley from the dale head all the way to a distant Penhill. The bridleway was largely invisible on the ground but the going underfoot was easy enough as I dropped down to a house and high footbridge, Grisedale Crossing, which crosses over the Settle-Carlisle railway. On the other side of the railway I followed a drive out on to the road. Turning right I walked past the Lund Viaduct down to the road junction. Here I treated myself to a pint of lemonade and a packet of crisps at the Moorcock Inn. From the Moorcock I turned right to reach the Pennine Bridleway. From there it was a simple case of following the bridleway underneath Dandrymire Viaduct back to Garsdale Head.